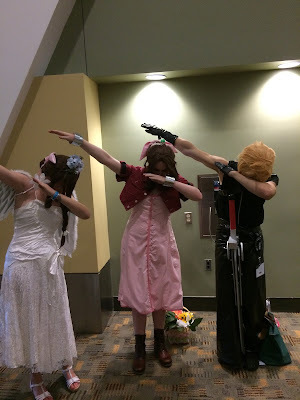 If I had to pick a single word to describe the three-day event that has been the Otakon Japanese Animation Convention in Baltimore, it would be big. Big location, guests that are big names in the anime industry, with an abundance of big personalities walking to and from the different halls.Which makes it all the more interesting that due to the convention's ever rising attendance numbers, that this volunteer-run event will be changing locations in 2017. From Baltimore to Washington DC, equally big changes are on the horizon for this beloved convention. 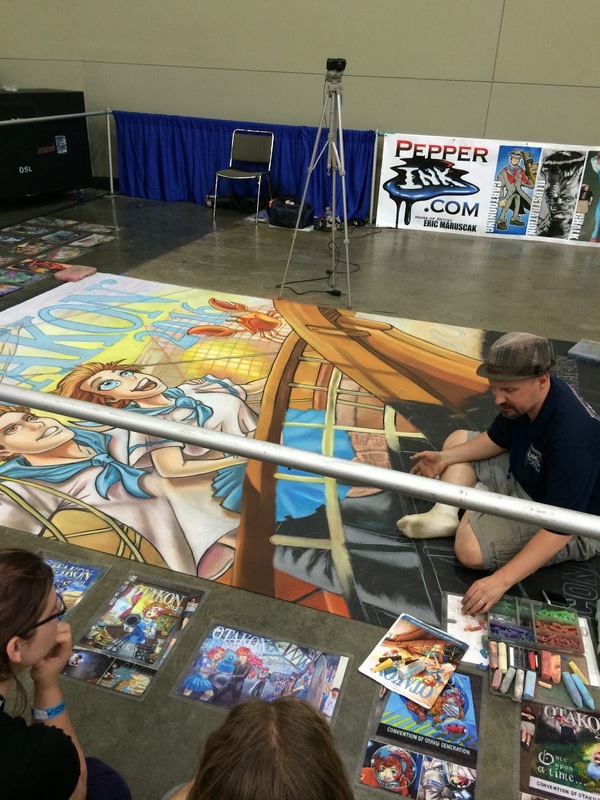 Despite the uncertainty that is sure to come with a big change like this, Otakon 2016 remained the unique spectacle it has always been. A celebration of Japanese animation and culture that is unparalleled on the east coast of the United States. From the moment you walk into the Baltimore Convention Center for registration, it is easy to get overwhelmed by the sheer size of the crowd. All donning their chosen cosplay (some made out of rather thick material) despite the blistering August heat wave. Some costumes fans have thrown together at the last minute (myself included) or fans who have clearly a lot of forethought and passion into constructing their outfit, piece by piece. Entire photo shoots for particular fandoms are arranged for those individuals to get their time in the spotlight alongside their fellow fans. Even entire contests are put together for these masters of craft to put their work on display for all to see. 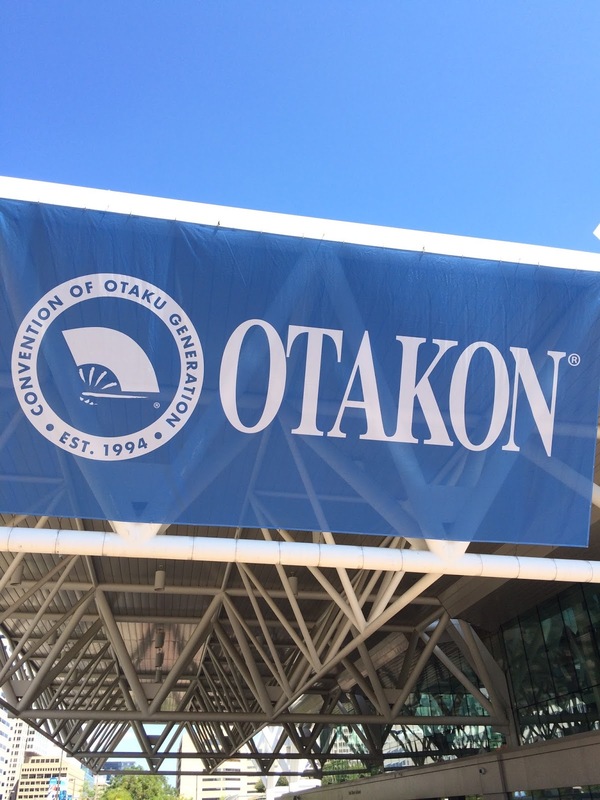 On top of all this, Otakon has a tight schedule of anime episode screenings, Q & A panels with the major guests, autograph signings, movie premieres, concerts, and contests for fan created content (Fan Parody nights, the Anime Music Video Contest and the Otakon Fan Film Contest). Even after all that, if you still find yourself at a loss of what to do, there is always the warehouse size Dealer's Room, offering a wide variety of swag inspired by anime, video games and popular culture. 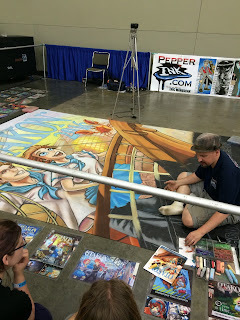 While the equally large Artist Alley, allows talented artists to sell their incredible fan inspired prints of the shows and characters they love. These have always been a staple of the Otakon experience. Though each year, the volunteers of Otakorp have always found ways to make each year unique. This year was no exception. A premiere screening of Funimation's new dub of the anime classic Vision of Escaflowne, complete with Q/A with the dub cast and the anime's original director Kazuki Akane. Special guests from the anime studio PA Works in celebration of their 15th year anniversary, featuring several panels/screenings and a special art exhibit featuring their work over the past 15 years in animation. Two concerts featuring voice actress/singer Yui Makino, and Japanese rock band ALL OFF. With so much going on it is almost an impossibility to come to a convention like this and expect to do and see everything you want. Like with every convention, is important to plan ahead and prioritize certain events/panels that you want to go and work the rest of your schedule (including time spent eating and sleeping) around these events. But even then you're still not 100% guaranteed a spot in the panel, again due to sheer amount of people all wanting to see the same thing. If I had to pick out a major drawback of this particular convention, was due to the fact of how quickly rooms for certain panels seemed to fill up. 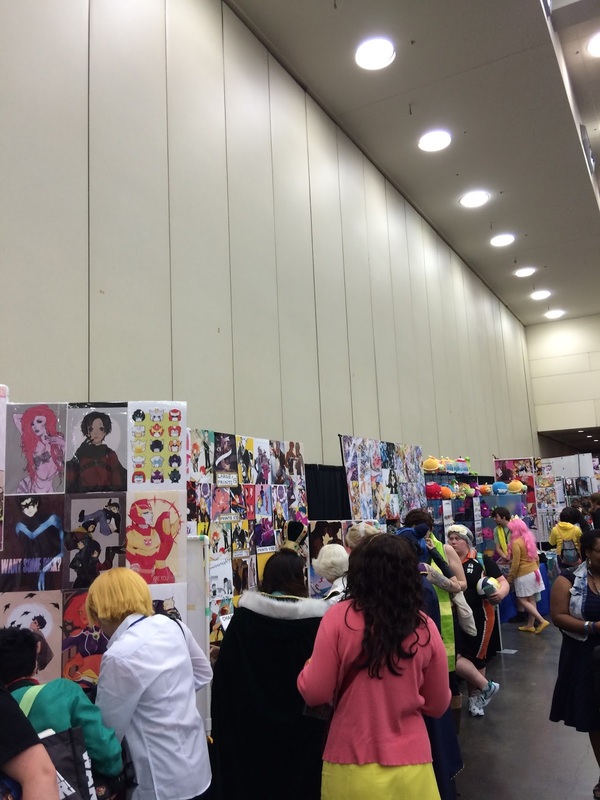 This is not so much a fault with the staff but just another stark reminder of how Otakon's Baltimore location has sadly lost the capacity to cater to the yearly attendees. All the more reason why the idea of changing location to a potentially larger building or buildings would be beneficial. Still with all the positives and negatives that come with going to a convention of this size: sacrificing eating and sleeping to wait in line, and wandering around in circles for what feels like hours just to find that one panel you want to see, only to find that it has been already filled to capacity, Otakon is still worth visiting if you are a die-hard or even casual consumer of Japanese animation. Because it is an event that is put together and organized by fans for fans. 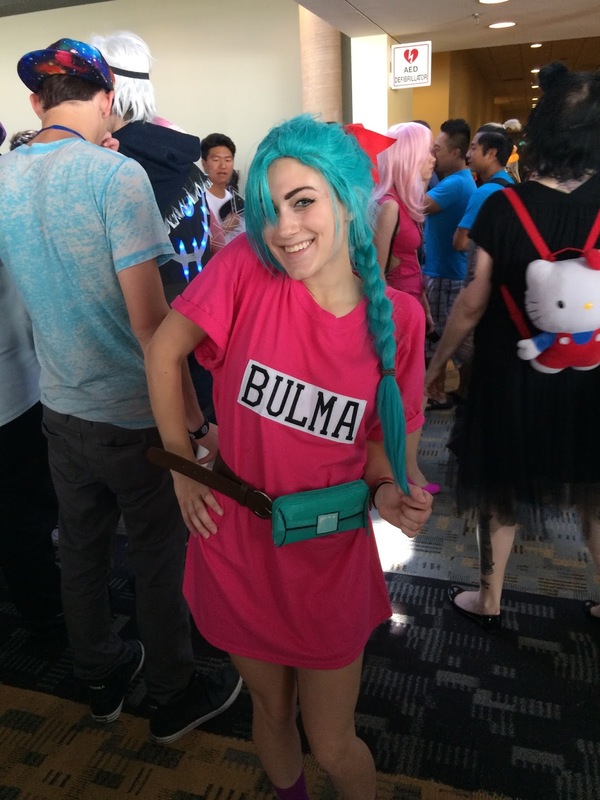 That level of kinship runs deep into the culture of the Con itself and you can see it when people's faces light up when they see someone dressed up as their favorite character and ask for a photograph. Sometimes people continue to go on their way or maybe they take a minute to talk about how they made their costume, or what was their favorite part of the show they both clearly love. Little moments like this are truly what makes Otakon a special event. And people will do it. 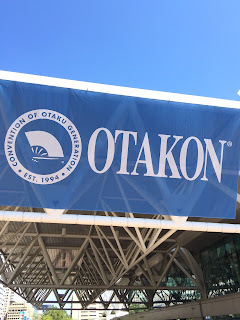 Regardless of what may need to change to fit with the new location in Washington DC, the level of friendliness and camaraderie that is demonstrated yearly by Otakon's staff and attendees with undoubtedly remain the same.